Important recording studios are more than just bricks, mortar and audio equipment to musicians. The Rolling Stones named a song in honour of the Chess Records Studio and Sonic Youth acknowledged New York’s Echo Canyon Studios by naming their 12th studio album, Murray Street, in tribute to a site that had played a key role in their success. 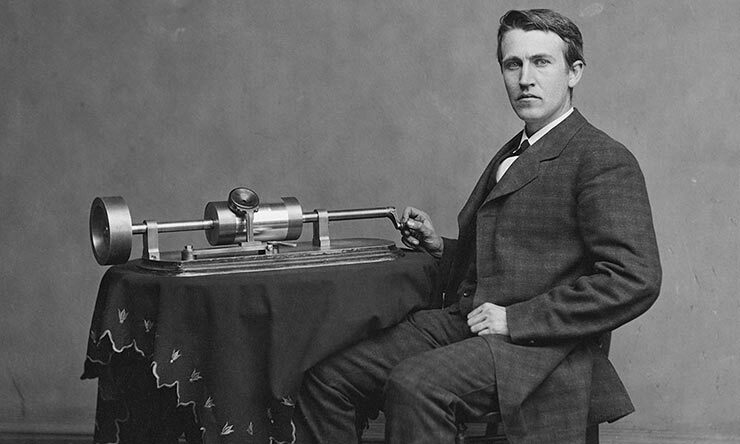 The roots of the recording studio go back to 19th-century inventors such as Thomas Edison and Alexander Graham, who laid the groundwork for the phonograph industry. By the time of the First World War, recording studios were appearing in major cities throughout the world, including the first OKeh Records studio, in New York, which was set up by Otto KE Heinemann in 1918. At that time, musicians would be recorded as they played or sang in real time, and the performance would be captured directly on master discs. The big transformation in that decade was when microphones and amplifiers could be electronically mixed to form a single signal. The music industry never looked back, and Victor, Colombia and HMV were among the first record labels to seize on the ability to record electrically and organise an industry to produce and market the records that were now mass-selling products. In the 30s, record companies were focused on producing and selling soundtracks to the film industry. However, the idea that recording studios could play a key part – in terms of equipment and atmosphere – in the creation of great music took hold in the 40s, with the proliferation of tape as a recording medium (when thermos plastic allowed for considerable improvement in the sound quality of recording). Companies such as RCA – who maintained studios in New York, Chicago and Hollywood – Decca, Universal Recording Corporation and Columbia Records began to focus on developing studio techniques. The post-war era also saw the rise of important independent studios such as Radio Recorders in Hollywood, Gotham Studios in New York and The Barn in Nashville. Pioneer Bill Putnam, an early architect of the modern recording studio, used techniques at his studio at Chicago’s Civic Opera that would come to define the modern record engineer, such as the use of tape and multi-tracking, creatively-deployed reverbs and overdubbing. Hazard “Buzz” Reeves, whose work developing Cinerama for the movie industry helped advance the stereo hi-fi revolution, worked closely with Norman Granz (the founder of Verve Records) and was behind many significant jazz recordings, including Charlie Parker With Strings. Parker’s groundbreaking album was recorded during 1949 and 1950, and spanned a time of transformation in the recording industry, which was about to see a boom in the long-playing 33 1⁄3rpm microgroove LP record, when the quality of record pressings improved and engineers understood more about where to place new condenser microphones. On 3 January 1950, Sam Phillips, a young talent scout, DJ and radio engineer from Alabama, opened the Memphis Recording Service on Union Avenue, in Tennessee, in a converted car garage. Phillips opened his doors to amateur singers, recorded them and then tried to sell the tapes to major record labels. He was soon attracting talents such as Howlin’ Wolf and BB King, and his small studio became one of the cradles of rock and R&B. The studio that changed the world of music really was humble: a small storefront property with a front office, a 20 x 35-foot live area and a tiny control room equipped with a portable, five-input Presto mixing console and amateur Crestwood and Bell tape recorders. The music made at Sun Records was full of experimentation, and Phillips’ echo techniques helped create hits such as ‘Blue Moon Of Kentucky’ for Presley. In 1956, the studio was home to one of the most famous events in musical history, the “Million Dollar Quartet” jam session with Presley, Perkins, Lewis and Cash. Phillips’ big problem, however, was that Sun had only a rudimentary distribution system and could not compete with the large national record corporations. In late 1956, RCA bought Presley’s contract from Phillips for $35,000. 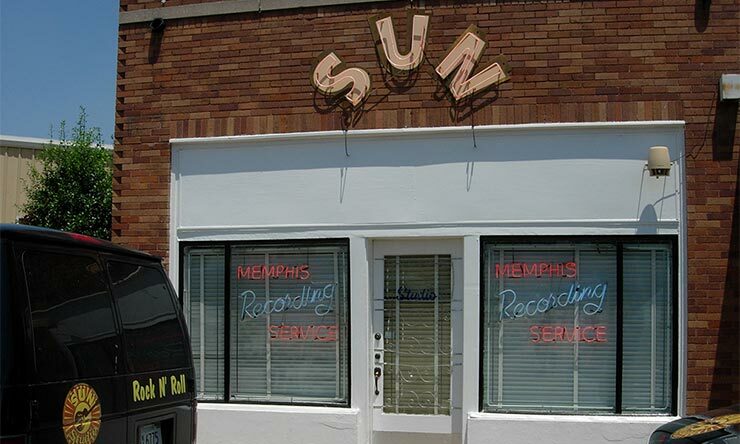 Sun Studio is now a popular tourist destination and still offers night-time recording sessions. The year Presley left Sun also saw a significant advance in studio design, when Capitol Records completed the Capitol Tower, a 13-storey building that is one of the most iconic buildings in Los Angeles. Designed by Louis Naidorf, the tower resembles a stack of records and the 90-foot spire blinked “Hollywood” in Morse code at night. 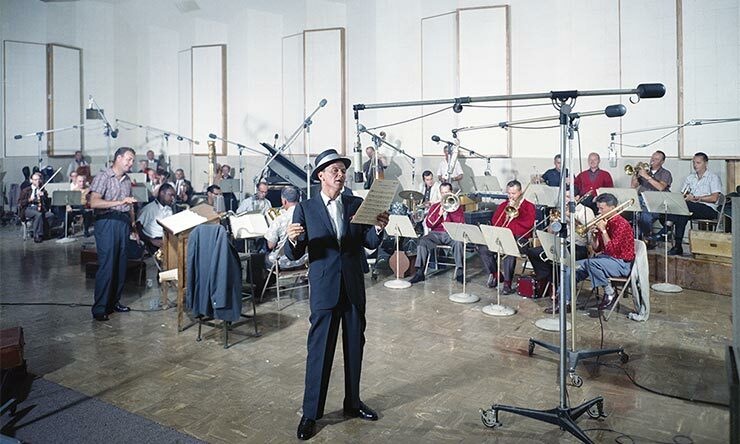 Inside the building, Michael Rettinger pioneered state-of-the-art acoustic techniques that were used on the first record made there, Frank Sinatra Conducts Tone Poems of Color. Over the next decade, hit songs from hundreds of musicians, including Bobbie Gentry, Peggy Lee, Nat “King” Cole, Glen Campbell and The Kingston Trio, were recorded at the Hollywood studio. Capitol even issued a promotional film in 1958, narrated by Tennessee Ernie Ford, which saluted the movable sound panels in the building’s three recording studios, with wood on one side and fibreglass on the other, while also explaining that the floors were a blend of concrete and cork to deaden the possibility of interference. In 1959, when Capitol was recording two more Sinatra albums, a cathedral of jazz opened across on the eastern seaboard with Rudy Van Gelder’s studio in Englewood Cliffs, New Jersey. This beautiful acoustic setting, with a 40-foot-high cedar ceiling held up by arches of laminated Douglas fir, was where artists such as Horace Silver, Art Blakey, Joe Henderson and Antônio Carlos Jobim made some of their finest work for Blue Note Records. WMGM’s Fine Sound Studios was another place where great jazz was made in the 50s for Granz, including albums for Mercury/EmArcy by luminaries such as Count Basie, Billie Holiday, Johnny Hodges, Gerry Mulligan, Max Roach, Clifford Brown, Roy Eldridge and Dinah Washington. The groundbreaking Miles Davis/Gil Evans/Gerry Mulligan sessions that were eventually collected as Birth Of The Cool was also recorded there. Old churches, because of their superb acoustics, often worked well as revamped recording studios. The Columbia Records 30th Street Studio, for example, was a converted Armenian church with a ceiling more than 100 feet high. The tall ceiling of a converted church also contributed to the fine sound at Pythian Temple, a former meeting place for the Knights Of Pythias, which was rented out to Decca Records in the early 40s, and where Louis Jordan, Billie Holiday and Buddy Holly cut records, and Bill Haley And His Comets laid down ‘(We’re Gonna) Rock Around The Clock)’. One of the most successful of all recording studios was RCA Studio B, which opened in Nashville in 1957. The studio, which recorded The Everly Brothers and Presley, became known for producing the iconic “Nashville Sound”, a style known for its particular use of background vocals and strings. 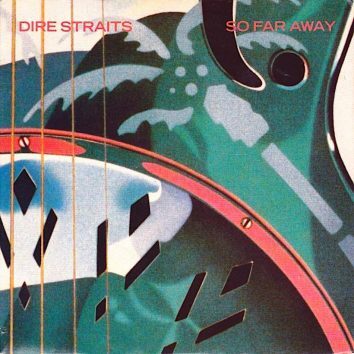 The studio recorded more than 35,000 songs, of which more than 1,000 went on to become Billboard hits. In this period in the late 50s, the easing of import restrictions also meant that burgeoning British recording companies, such as Pye and Phillips, were making their mark in the UK as they introduced innovations to studios such as multi-track recording. In simple terms, the history of recording studios can be roughly divided into two time periods: before and after the 60s. During the remarkably creative period from 1965 to 1967, the studio changed from being simply a place of work for musicians, engineers and producers, to becoming an artistic hub. The role of the producer was transformed during another period when technology was a significant agent of change. Multi-tracking sparked greater experimentation in the studio: eight-track recording became commonplace in the 60s, and 16-track recording was introduced in the UK, initially by Trident Studios, in 1969. Forty years on, 32-track digital recorders for simultaneous mixing are commonplace. Trident, based in Soho, London, was the first UK studio to use the Dolby noise reduction system. Seminal albums made at Norman Sheffield’s studio included James Taylor’s eponymous debut album (1968) and The Rolling Stones’ Let It Bleed (1969). In the 70s, Trident Studios was the home of Queen’s first four albums as well as David Bowie’s The Rise And Fall Of Ziggy Stardust And The Spiders From Mars, T.Rex’s Electric Warrior and Lou Reed’s Transformer. Sheffield wanted a relaxed vibe (he banned engineers from wearing the white lab coats they wore at some recording studios) and he knew the value of great musical instruments. The famous “Trident Piano” was a handmade 19th-century Bechstein grand piano which has been described as “the best rock’n’roll piano ever”. Elton John’s ‘Your Song’ is just one of the seminal songs played on that piano. The UK has been home to dozens of superb recording studios, including Sarm West in Notting Hill (Led Zeppelin, Bob Marley, Band Aid); Britannia Row in Islington (Pink Floyd, Squeeze, Joy Division) and Olympic Studios in Barnes (The Rolling Stones, Jimi Hendrix). However, none can match the historical significance of Abbey Road Studios in St John’s Wood. Paul McCartney described Abbey Road, formerly EMI Studios, as “the best studio in the world”, saying that it has “depth and tradition”. The building was first used for music when it was acquired by the Gramophone Company in 1931. Though The Beatles are synonymous with Abbey Road, it is also the recording site of Pink Floyd’s The Dark Side Of The Moon, Duran Duran’s eponymous debut album and, in recent times, music from Radiohead, Lady Gaga, James Blake, OneRepublic and Ed Sheeran. The Beatles went there for their first recording test with George Martin in June 1962, and they were bowled over by the facilities. The three studios had high ceilings and tremendous acoustics (the main hall was big enough to accommodate an orchestra) and the Fab Four enjoyed fooling around in the storage room, which housed hundreds of percussion instruments. Abbey Road had character, from the large Indian rugs on the hardwood floors (to cope with problems from reflected sound) to the sweeping wooden staircase. For the song ‘Yellow Submarine’, producer Geoff Emerick put John Lennon and co into one of the echo chambers to make them sound like they were in a submarine. The chamber, which was only three feet high, with water dripping off the walls, produced the perfect effect. The Beatles continually broke new ground with their innovative use of feedback, microphone techniques and backwards recording . One of the keys to their success was Abbey Road’s talented sound engineers, who helped them realise their musical visions and gave them the necessary modified equipment to do so. The control room at the top of the stairs was described by McCartney as “where the grown-ups lived”. This was also an era when bands were given time to make albums at a relaxed pace. 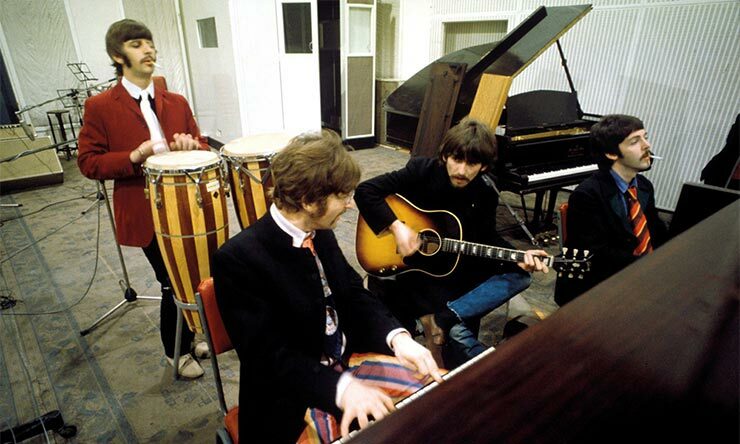 Since EMI owned the recording studios, The Beatles were sometimes afforded months to record their songs. An estimated 700 hours of work went into recording Sgt Pepper’s Lonely Hearts Club Band between November 1966 and April 1967. Production costs were £25,000 – around half a million pounds today. 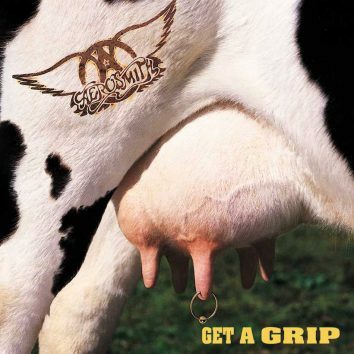 British musicians were, however, still paying attention to recording studios in the US. McCartney frequently asked Abbey Road executives to produce “an American sound”, insisting that producers at Motown got a richer bass sound than studios in Britain. Berry Gordy could never be said to have lacked confidence. 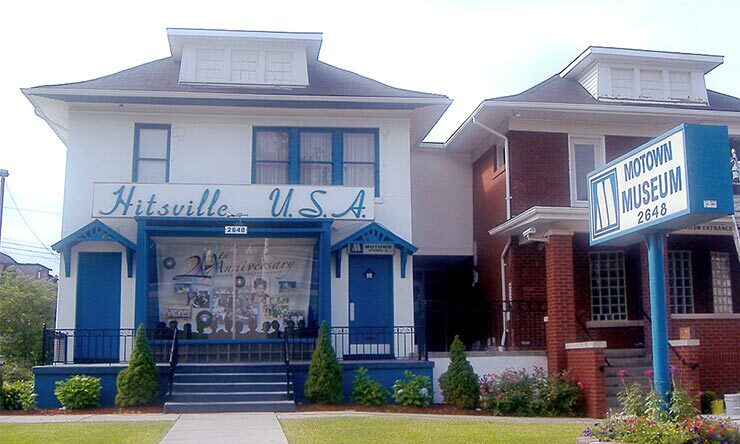 In 1959, he put up a sign that read “Hitsville USA” on his house when he turned a former photographer’s office and garage into a studio. Gordy’s record label, Motown, was a stunning success and, within seven years, the studio occupied seven additional neighbouring houses in West Grand Boulevard, Detroit. Gordy had a template for success. Each morning, Motown would hold a “quality control” meeting – where honest opinion was valued – to decide what to record over a 22-hour day. Initially, their equipment was basic. They had three tracks. One was used for drums and bass; the second for other instruments; and the third for the vocalists. The formula was a triumph, however, and hit after hit followed for artists such as The Miracles, The Supremes, Marvin Gaye, The Temptations and Stevie Wonder. Motown quickly became the most successful African-American business in the music world. Like Sun in Memphis and Motown in Detroit, Chess Records was run out of small premises. Chess started out as small recording studios attached to offices and facilities for distribution. 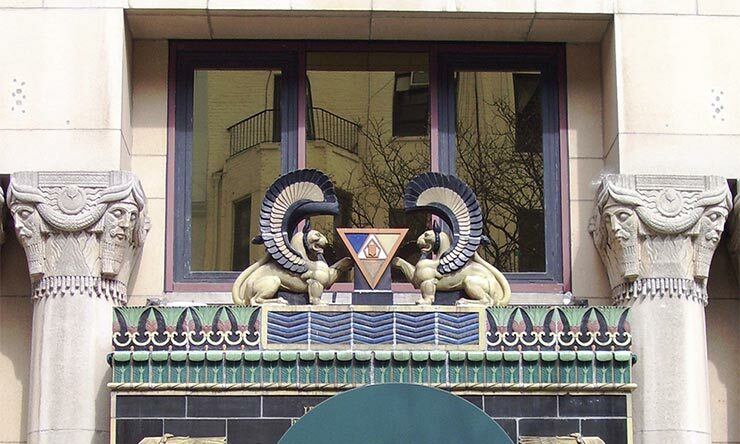 Chess had several different locations in Chicago, but the most important was 2120 South Michigan Avenue, which was immortalised in a song by The Rolling Stones (it is now the home of Willie Dixon’s Blues Heaven Foundation). 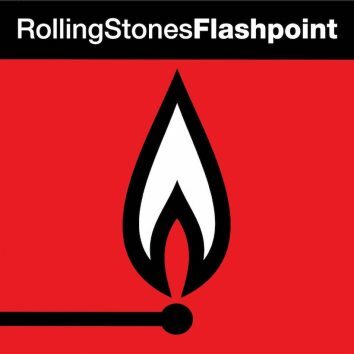 The Rolling Stones, incidentally, left their own mark on the history of recording, with their Mobile Studio. Instigated in the late 60s by Mick Jagger, the studio on wheels (a DAF truck) had a control with the latest 16-track technology. As well as recording some of Exile On Main St, it was used for other memorable songs, including Deep Purple’s ‘Smoke On The Water’ and the live recording of Bob Marley’s ‘No Woman, No Cry’. The Stones were following in the tracks OKeh Records, who sent mobile recording trucks to US cities such as Detroit and New Orleans in the 20s. Though many of the most famous recording studios are in the US and UK, there have been important ones around the world – from Canada’s Studio 2 to Studio 301 in Australia. Few studios, however, can match the status of Germany’s Hansa Tonstudio, which can rightfully claim to be a site of historical music importance. When Britain’s athletes walked out for the opening ceremony of the 2012 Olympics, they did so to David Bowie’s ‘“Heroes”’, a song written and recorded in 1977 in West Berlin’s Hansa Tonstudio, which overlooked the Berlin Wall and its watchtowers. This desolate wasteland setting sparked a creative resurgence in Bowie, who had moved to Germany to cope with a cocaine addiction and a collapsing marriage. “It was literally like being reborn,” he admitted later. The complex, first used as recording studios by record label Ariola in the 60s, was bought by brothers Peter and Thomas Meisel. In 1976, their Meisel Music Publishers bought the property and fitted it with recording equipment. The Meistersaal (main hall), which had hosted classical music concerts in the 20s and later served as a social club for the Nazi SS, was turned into Studio 2, and bomb-damaged rooms were renovated into smaller modern recording studios. Over the next 20 years, the roll call of celebrated albums made at Hansa – utilising the eerily dark sound quality – afforded the studio near-legendary status. Rock stars from around the world flocked to Berlin to make albums, including Bowie, Iggy Pop and R.E.M.. Boney M – for the label Hansa Records – cut million-selling hits such as ‘Rivers Of Babylon’ and ‘Brown Girl In The Ring’ and U2 recorded their acclaimed album Achtung Baby there. Mark Ellis, known by his pseudonym Flood, was originally Hansa’s sound engineer before working closely with U2. The building, with its spacious rooms and the herringbone flooring of the beautiful early 20th-century ballroom, was hailed by Flood as being “as much an instrument as any guitar, drum or synthesiser”. Depeche Mode’s producer Gareth Jones recalls running cables up and down the stairs between studios to get interesting reverbs and delays for the sound on the album Black Celebration. “We were throwing beats around the whole building in a really fun, very noisy way,” Jones recalled. Other seminal albums recorded at Hansa include Tinderbox, by Siouxsie And The Banshees, but nothing quite matches Bowie’s “Berlin Trilogy” – Low, “Heroes” and Lodger – which was recorded there between 1977 and 1979. The strange setting led to a fortuitous moment of inspiration. As Robert Fripp’s guitar riffs vibrated through the building, Bowie was struggling to find lyrics for the song ‘“Heroes”’. Then, peering through the window, he spied the famous kiss “by the wall” between Visconti and one of the backing singers, and the words for his song flowed. By the time Bowie returned to Hansa in 1982, to record his EP Baal, the studio had begun a period of investment in new technology and the SSL 4000E console desk, in eye-catching “Hansa blue”, cost around £2.5 million in today’s money. It is considered one of the best pieces of recording equipment ever made. In the 80s, Nick Cave, Marillion and The Psychedelic Furs also flocked to Hansa, and even in the 21st Century it has remained a destination studio for leading artists such as KT Tunstall and Manic Street Preachers. Brian Eno, who worked with Bowie at Hansa, once said that “if you had a sign above every studio door saying ‘This Studio Is A Musical Instrument’, it would make such a different approach to recording.” That ethos was as true of Hansa as it was of Muscle Shoals Sound Studio in Sheffield, Alabama, which was originally started by the four members of the Muscle Shoals Rhythm Section (known as The Swampers) after leaving FAME Studios. The unmistakable sound The Swampers took with them to the new studio drew in some of the world’s top musicians, from Paul Simon and The Rolling Stones to Willie Nelson, even though the facilities at the concrete block building – previously a coffin show room – were rudimentary. But it was the sound that counted, as it was in Studio One (in Kingston, Jamaica), which also became renowned for its resident reggae musicians. The sites of recording studios often have rich histories. A&M Records’ studio in Hollywood – where The Flying Burrito Brothers, Carpenters and Joni Mitchell recorded in the 60s and 70s – had first been a film studio built by comedian Charlie Chaplin in 1917. Nevertheless, memorable music can be made in a place without a glamorous past. Surrey Sound Studio, in sleepy Leatherhead – where, in the late 70s and early 80s, The Police recorded their first three albums – was a small converted village hall. It is now a sports goods shop. In the 70s, the Minneapolis recording studio Sound 80 attracted some of the finest musicians of the age, including Bob Dylan (Blood On The Tracks), Cat Stevens, Prince and Dave Brubeck. In 1978, the St Paul Chamber Orchestra made one of the first digital recordings to be released commercially. The music was captured on a prototype digital recorder and engineers at Sound 80 were pleased with the way the new technology eliminated some of the “flutter” of analogue recordings. Sound 80 studio is now home to Orfield Labs, a research facility that contains an anechoic chamber, named by The Guinness World Records as “the quietest place on Earth”. The widespread use of multi-track technology in the modern era meant that musicians often spent long spells in recording studios. As a result, many residential studios were established, often away from cities. The Rockfield Recording Studio in Monmouth, Wales, founded in 1965, is reportedly the world’s oldest residential studio and is where Queen’s ‘Bohemian Rhapsody’ was cut. Rockfield’s residential properties were built out of dilapidated farm buildings, but musicians loved the solid stone studios and artists as diverse as Dave Edmunds, Black Sabbath, Motörhead, Carlene Carter, Adam And The Ants, The Pogues and Oasis (for ‘Wonderwall’) have used the facilities. In the 90s, Rockfield was the studio of choice for Coldplay, who liked its isolation. Island Sound Studios, in Honolulu, may not be able to boast the delights of Monmouth’s historic River Monnow, but Dr Dre and Kanye West are among the musicians who have gone there for a recording studio which is just five minutes from the snorkelling at the picturesque Hanauma Bay. The history of popular music is filled with iconic recording studios – from Stax Studios to Gold Star Recording Studios (where Phil Spector constructed his “Wall Of Sound”); from Sunset Sound Recorders, in Los Angeles, to Columbia Studios in New York (where Bob Dylan cut his first album); from Headley Grange to Electric Lady Studios (created by Jimi Hendrix just weeks before his premature death, and which is still in use). It is no wonder so many have been turned into museums and visitor centres. The music world of 2018 would probably be unimaginable to the executives of OKeh Records a century ago. 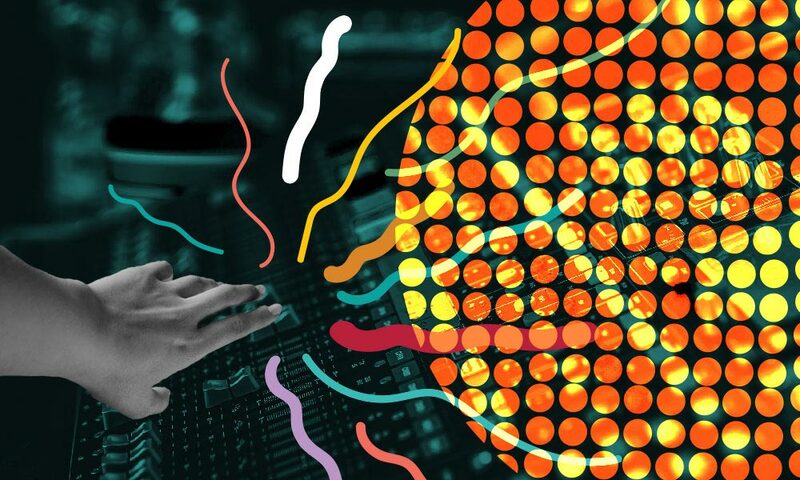 But what recording studios have in common now, from the smallest independent outfits to the $100 million luxury BOP Studios in South Africa, is that they have been radically transformed by software. To survive in the digital age requires the ability to adapt. Universal Music artists have access to modern studios in London, which are equipped with the latest music-making tools, such as Pro Tools HD, Native 12, Logic Pro X, Neuman U87 and Avalon 737 Valve Vocal Chain – as well as a good old-fashioned upright acoustic piano. Among the musicians who have worked in Universal’s studios in the past are Adele, Kylie Minogue and Lisa Marie Presley. That impulse to make a record is nothing new, of course. In the 50s, thousands of people would go into small telephone-like booths in shops to use the Voice-O-Graph system to record their voices directly on to a phonograph disc. Though many studios have closed – Hammersmith’s Townhouse Studios, where Phil Collins and Pulp recorded, was sold to make way for luxury flats – the future will not just be about making music on handheld smart devices. The 2017 US Census Bureau Report revealed that that there were 1,700 active recording studios in the US, with 336 in Los Angeles alone. In March, Abbey Road Studios, which has undergone its biggest transformation in 86 years, and now has two new studios and a Mix Stage for film sound post-production music, won the prestigious 2018 Studio Of The Year Award at the Music Producers Guild. Kate Bush described the home of The Beatles as “a magical place”. Hopefully it could be part of a new golden age for the recording studios. Caribou’s problem was its altitude. Singers literally needed oxygen to sing. Plus acoustic instruments didn’t sound the same in the thin air. And it was in the middle of nowhere. And one now gone is Olympic, now a movie theater with, I understand, a small studio attached. When you visit Muscle Shoals/Florence, Alabama, visit the museum at the old recording studio! It’s fantastic. Thanks, this is a great article. No mention of Joe Meek? How can you not mention Joe Meek? Ok, it wasn’t a ‘studio’ as such, it was a flat above a bicycle shop, but his innovative production techniques were a key driving force behind the 60’s British sound. Great article. Proud to part of the last 40 years of it all. Started with Pink Floyd and lately those new Abbey Road rooms. And thanks for including Trident and my Dad, Norman Sheffield. Credit must also be given to his brother, Barry who engineered some of the first work too. If I can also point out Trident was the Worlds first 8 Track studio (not 16) and it was partly why the Beatles left Abbey Road to record Hey Jude at Trident. I’d love to chat with you about what we are up to now at Trident Cloud and our app Trackd. I’m sure you’ll like it.